We're very excited to introduce all-new HackTutors — The HackTutors 2.0! We've completely redesign the blog from the ground. 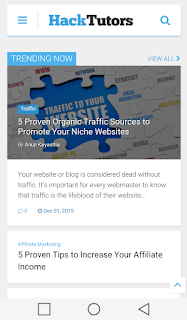 We have now all new design that enhances the user experience and usability of the blog. The new modern and unique design makes it more easier to navigate throughout the blog without compromising the browsing experience. The new design is sleek, fast, clean, and more readable than ever before. We redesign the blog in such a way that you get to see what's more important to you — content. Let's check out what has changed! You might have noticed it on the first sight — the new logo with all-new fonts. We have always focused on minimalism rather than the fancy graphics, and we'll continue to follow this concept in the future as well. The new logo is more minimalistic with our brand color — blue and back. This is the most important part of the page, and it's what we kept in mind while designing the blog from the ground — the content area. While taking the first step into the blog, you'll first see what you came to see without less distracting ads. We separated the widget area from the main content area so you can see the things you might be interested in after reading the content. We know you might be looking for other valuable articles, that's why we have put the list of our recently published contents into the widget area. We had received lots of request for Disqus comment system. You commented and we listened. Now you can comment on HackTutors using Disqus, Facebook or Blogger accounts. Now it's not an issue if you don't have a Blogger account — you can still comment on the blog with your Facebook or Disqus account. We didn't stop right there! We have good news for our mobile readers, too. The new design is fully responsive to any mobile device — tablet, smartphone, and even smartwatch. You name it! You can now read the blog through your mobile devices with the same amazing experience as in the desktop. All the articles, texts, images, and videos perfectly fits into your device. This will make your experience more fantastic. What do you think of the new design? Is it better than the previous version? Which one do you find better? We'd love to hear from you. Let us know what you have to say about the new design of HackTutors — share your opinion and feedback through the comment below. Hack Tutors — Blogger Tricks, Blogging and Social Media Tips: HackTutors 2.0!